Hawkesdene House Bed and Breakfast Inn and Cottages combines all the charm and comfort of an English Country House with the rustic beauty of the North Carolina mountains to provide a unique Bed & Breakfast Inn experience for couples (children 12 and older). For families with children of all ages. Five cottages are available -- three accommodating up to six people, two larger cottages up to 10 people. All 5 guest rooms in the Inn have private baths, cable TV's and comfortable seating. One room has kitchen, dining room and sofa bed in addition to regular queen bed. Prices of rooms in the Inn range from $70 to $95 (couple) per night including full breakfast; cottages $125-180 night, $550-750 week (breakfast not served in cottages) Open year round. No smoking, sorry no pets -- but we'll share our barn cat, two Great Pyrenees sheep dogs and four llamas. Hike from your door into the Nantahala Nat'l Forest to "Hidden Falls" waterfalls or to "Hawknest Peak". Many other hikes nearby. 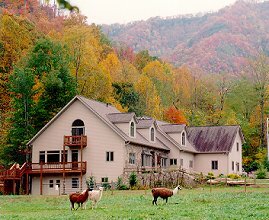 Horseback riding, whitewater rafting, tubing, mountain biking, trout fishing all nearby. To find us: Enter Andrews' main street from US74 (90 miles west of Asheville), turn right at Wachovia Bank onto Cherry Street (which changes name to Bristol Rd), go 3.3 miles to Phillips Creek Road (on left), we are 1/2 mile on Phillips Creek Road. Pavement ends at our driveway, You'll see our sign. This and other Andrews Bed and Breakfast Inns can be found here in The Register.